Nearly 54% of the country is in moderate or worse drought, according to the U.S. Drought Monitor, setting a record for the fourth straight week. Besides the expected increase in food prices (and insects), the survival of millions of trees is at stake. Prolonged periods of stress slow and reduce tree growth, and make them susceptible to disease. 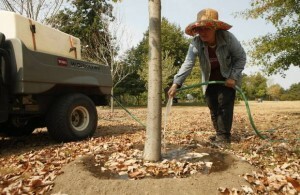 In some cases, young, parched trees are dying. These urban trees remove pollution, conserve energy, and have a net cooling effect that rivals air conditioners. Here’s a roundup from across the Midwest and elsewhere on efforts to mitigate the impact of record-breaking heat and drought on hard-working street trees.